Valenti Equestrian Club Resident Zealous Tale began as a Thoroughbred with a very bright future. As the son of leading sire, Tale of the Cat, Zealous Tale has an impressive pedigree. He was fast and featured a unique racing style. However, a misstep during training caused a fractured sesamoid. After healing from surgery, Resident Zealous Tale returned to training with well-known Southern California trainer Doug O’Neill, two-time Kentucky Derby winner and winner of several BC Championship races. After returning to training, Zealous Tale came up sore after a workout. His former owners, Abbondanza Racing, the race horse owner partnership with horse Goodyearforroses running in the Breeders’ Cup &amp; Great Friends Stable, run by Del Mar Thoroughbred Club Vice President Craig Dado, gracefully retired him. Owner Bing Bush, Jr. then began training him as a hunter jumper for his second career. Today, Zealous Tale lives and trains at the Valenti Estate. Note: MOST horses that retire from racing now get wonderful homes and second chances, thanks to several Thoroughbred aftercare groups – many of which are supported by TCA. The Valenti Equestrian Club, located in the Covenant of Rancho Santa Fe, is a hidden equine oasis that offers boarding and training services for dressage and hunter jumper aficionados. Within close proximity to the Del Mar Racetrack, the gated facility is located on 20 maturely wooded acres with riding trails that connect to the Rancho Santa Fe Covenant trail system. The Valenti Equestrian Club offers boarding and training services for dressage and hunter jumper aficionados. The expansive grounds include a variety of amenities, such as a competition-legal 20m x 60m dressage court with mirrors, extensive sprinkler system and exceptional footing that dries expediently during the rainy season; in/out barns, stalls and pipe corral accommodations; galloping track, grass and sand turnouts, large jumping ring and warm-up track, round pen; tack room, kitchen and laundry facilities, hot wash racks and stall cleaning two-times per day; private lakeside trail within the property boundaries; free WiFi; on-site horse trailer parking, security cameras and on-site staffing, 24 hours per day, seven days per week. The club is located within a short distance to the restaurants and retail establishments in the villages of Rancho Santa Fe, Solana Beach and Del Mar, with easy access to the I-5 freeway. Perhaps one of the most significant features of the Valenti Equestrian Club is the world-class professional trainers that are headquartered within the compound that offer their expertise to club members and boarders. Of particular note, Lena Nordlof-Davis was born and raised in Sweden and learned dressage skills from top riders. She actively competes and succeeds at FEI Grand Prix level events and has a passion for her dressage training business. In addition, the Horsemanship Academy at the Valenti Equestrian Club is a boutique riding school under the direction of Kajsa Wiberg, teaching the European traditions of horsemanship to both adults and children. Rounding out the training talent at the club is Guillermo Obligado, who has firmly etched a place for himself in the sport representing his native Argentina at the World Equestrian Games in Aachen, Germany and the World Cup Finals in Kuala Lumpur. He imparts his hunter jumper expertise to students who aspire to reach competition-level skills. To learn more about the Valenti Equestrian Club, visit www.valentiequestrianclub.com or call 858-759-9239 for information or a tour of the facilities. costumes. The event included an abundance of Halloween candy and a freestyle dressage performance set to music. The Horsemanship Academy is a boutique riding school teaching the European traditions of horsemanship. Visit www.valentiequestrianclub.com. 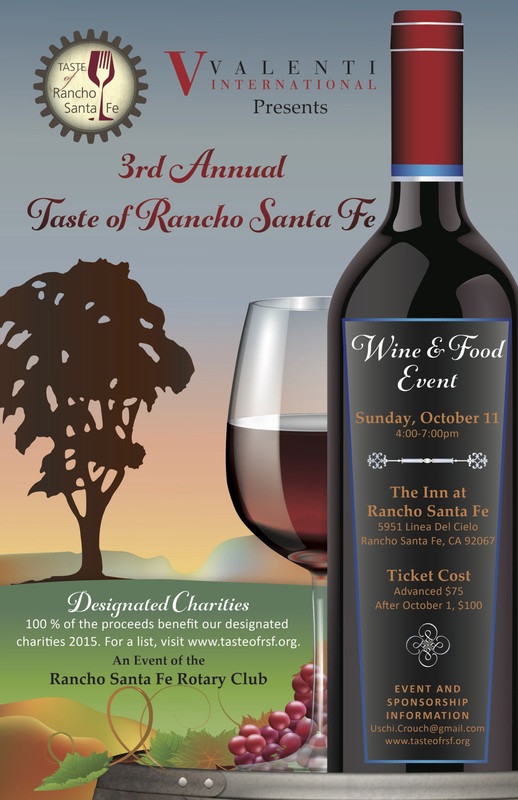 It is with great pleasure that I announce Valenti Foundation has elected to serve as the lead sponsor of the Rancho Santa Fe Rotary fundraising event, “Taste of Rancho Santa Fe”, that will be held on October 11, 2015 from 4:00 pm to 7:00 pm at the Inn at Rancho Santa Fe located at 5951 Linea del Cielo in Rancho Santa Fe. This event provides a unique opportunity to sample gourmet foods from renowned local restaurants and indulge in approximately 100 wine tastings from award-winning vineyards, while at the same time supporting a variety of local charitable organizations. Significant highlights of the event include tours of the extensive venue grounds, live entertainment, silent auction and opportunity drawing. I sincerely appreciate you taking the time to read this communication and for your support. Please visit valentifoundation.org, click on the Donate button to make a contribution big or small. All major credit cards will be accepted. As a Rotary International Paul Harris fellow, I personally would like to invite you to participate in this event as a sponsor to help further the mission of the Rancho Santa Fe Rotary Club. Your sponsorship will ensure the success of the “Taste of Rancho Santa Fe” and advance the philanthropic outreach necessary to support organizations in need of our support. The Rancho Santa Fe Rotary Club continues to live up to its motto of “Service Above Self” through a wide variety of activities within Rancho Santa Fe and surrounding communities. Founded in 1959, the Rancho Santa Fe Rotary Club has dedicated over 50 years of service to fulfilling the needs non-profit organizations. The funds raised at this event will be benefit multiple charitable organizations including: Miracle Babies; Kids Kingdom Orphanage, International Relief Teams; Just in Time, The Pendleton Cottages Project; The San Diego Children’s Discovery Museum and The Rotary Foundation; The Rancho Santa Fe Historical Society and Community Center. I am available to answer your questions at any time. My contact information is irene@rsfranch.com via email and my personal mobile phone number is (619) 997-9239. I look forward to hearing from you and hope you can help us. It is with great pleasure that I announce Valenti Foundation has elected to serve as the lead sponsor of the Rancho Santa Fe Rotary fundraising event, “Taste of Rancho Santa Fe”, that will be held on October 12, 2014 from 4:00 pm to 7:00 pm at the Inn at Rancho Santa Fe located at 5951 Linea del Cielo in Rancho Santa Fe. I sincerely appreciate you taking the time to read this communication and for your support. Please visit www.valentifoundation.org <http://www.valentifoundation.org>, click on the Donate button to make a contribution big or small. All major credit cards will be accepted. Can you put a price on the beautiful life in Rancho Santa Fe? You could if you rented La Bella Vida, a Spanish-style 6,000-square-foot private home set on a 4-acre estate, complete with mosaic-tiled pool, gazebo and fountain. To hold her 40-guest outdoor wedding there on May 17, San Francisco bride Kira Maisel paid about $14,000 to Estate Weddings and Events, a San Diego company that specializes in renting out owner-occupied luxury homes for weddings, corporate retreats, charitable events and Hollywood location shoots. Cofounded in 2007 by a San Diego State University graduate then in her 20s, the niche company gives wealthy homeowners around the country — with about 15 in San Diego County — the chance to earn thousands in tax-free income for the use of their resort-style properties for a day. At the same time, brides and other renters get a taste of life in some of America’s ritziest enclaves. Renting these multimillion-dollar homes — from oceanview homes in La Jolla to equestrian estates in Rancho Santa Fe — costs anywhere from $3,500 to $30,000, depending on the property and the size of the event. Under a full-service contract, Estate Weddings & Events handles everything from the liability insurance to arranging for the catering, valet, tent setup, even hiring security guards to watch over pricey works of art. Though La Bella Vida wasn’t Maisel’s first choice, it turned out to be the right one. La Bella Vida’s owner, Roblee Valentine, says that response is exactly why she rents out her estate. “Seeing people enjoying my home makes me happy,” said Valentine, founder of The Ranch EQ, a luxury real estate firm in Rancho Santa Fe. “I use my home quite a bit, of course. I love to entertain.” But she also travels often to compete in horse-jumping shows, and her grown children are out of the house. In 2007, Jamie Ehrsam was fresh off earning a business and hospitality degree from SDSU, working as a wedding and events coordinator and living in Pacific Beach. Ehrsam was helping her boyfriend’s sister find a beach house to rent so she could hold her dream wedding in the sand. The idea for Estate Weddings & Events was hatched, and she and her boyfriend, Luke Whittaker, launched the business with little more than a hastily created website. The company started small, with just three or four properties in San Diego, but it orchestrated big events. “It was the year of over-the-top weddings, before the recession,” she said. Free-spending corporations were throwing lavish parties, too, and Estate Weddings & Events took off. The recession didn’t really slow it down: “We still did weddings; they were 50 guests versus 200 guests. But the inventory exploded,” as people, even in the highest income brackets, were looking to make extra money. As an added incentive, the federal tax code allows the income earned for renting a primary residence for fewer than 15 days a year to be tax-free. The company’s current San Diego client roster includes doctors, real estate investors, a renowned local architect and a high-end matchmaker. Why would they entrust Ehrsam with arguably their most valuable possession, opening their doors to hundreds of complete strangers? Only two of the homeowners listed with Estate Weddings & Events would agree to be interviewed. Both of them said they feel their interests as homeowners are the company’s priority. “Jamie and her team, they’re very professional and very good at what they do,” said Valentine, who already knew and trusted Ehrsam, through The Ranch EQ, when she signed on. In addition to arranging for liability insurance and private security, Estate Weddings requires renters to put down a hefty security deposit, and Ehrsam said they also take video of the property before and after an event. There’s been only one minor mishap at La Bella Vida, said Valentine, during a showcase tour for wedding planners, when a chef left a lemon on the marble kitchen counter and it ate through the finish. “Within 24 hours, they had somebody out there fixing it,” Valentine said. Another of Ehrsam’s clients, dating service owner Irene Valenti, has had multiple events at her sprawling 16.5-acre, Mediterranean-style estate, which features a lake ringed by weeping willows, walking and riding trails and a rose garden. One of the largest events was a fundraiser for Ronald McDonald House, with about 500 people in attendance. Though not Valenti’s primary residence — her company, Valenti International, is based there — she expects Estate Weddings & Events to treat it as if it were. “We’ve never had one experience where someone has taken a pen or broken a piece of art,” Valenti said. Good word-of-mouth is what drives much of her new business, Ehrsam said. Also effective is sending mailers directly to luxury property owners. “The old traditional money in Rancho Santa Fe, they still read their mail, thankfully,” she said. Ehrsam wants to make something clear: Estate Weddings is not a wedding planning company. Don’t tell that to Kira Maisel, the San Francisco bride. Last summer, she was looking for a place for her wedding to Kamo Asatryan, 28, who works for a Bay Area tech startup. Maisel Googled “weddings at private homes” and up popped Estate Weddings & Events. Even though the couple were not looking to marry in San Diego, they saw a property in Escondido, near Elfin Forest, with a view that reminded Asatryan of his native Armenia. They booked the estate for May 17. On Wednesday, May 14, they flew to San Diego to find wildfires raging across North County, including one near their rented home. It wasn’t the kind of wedding drama they expected. On Thursday, they wrestled with telling their Bay Area guests to cancel their flights but decided not to. By early Friday, it looked like the estate would be spared. Then, at 3 p.m., exactly 25 hours before their ceremony was to start, the road to the property was shut down so a firefighting helicopter could fill up with lake water. Taryn Walker, Estate Wedding’s director of special events, assured the couple she could find another venue. Walker contacted Valentine about using La Bella Vida and drove the bride and groom there for a tour. With a go-ahead, Walker scrambled to reschedule the entire wedding — caterer, table and chair rentals, cupcake vendor, florist, guest shuttle bus — for the next day. “We wouldn’t have had a wedding if it wasn’t for Taryn,” Maisel said. She said that post-ceremony, her new husband said he thought the larger Bella Vida estate turned out to be better in the end.